Another in Love Food’s cheap meals to make: using an inexpensive white fish and vegetables found in the fridge, this is a delicious and quick supper to make mid-week. Dawn: This is an attractive looking meal that appeals to our visual senses and as we ‘eat with our eyes’, this ticks all the boxes! It’s another cheap meal to make, too and won’t break the bank. So, if you are looking for a tasty and delicious supper after work which is economical to make, this is for you! Take the fish and place on a large enough piece of tin foil that the foil will easily wrap around the fish. Sprinkle about a third of the parsley onto the fish portions and add a tiny splash of cooking oil to stop the fish from sticking to the foil when it is baked. Add seasoning. Fold the tin foil around the fish and create a sealed parcel by securing all sides and ends. Place on a baking tray in the middle of the oven and bake for approximately 35 minutes if using frozen fish. If using fresh fish, adjust cooking times accordingly until the fish flakes away when touched with a fork. Heat the remaining cooking oil in a non-stick frying pan on a medium heat. When the oil starts to appear to bubble and a little heat haze looks to be coming off it, add the mushrooms and cook for about 5 minutes. Add the frozen peas and cook for 3-5 minutes before adding the sweetcorn, chopped sun dried tomatoes and courgettes. Add the remaining parsley and cook for a further 5-10 minutes until the vegetables are soft to your preference. 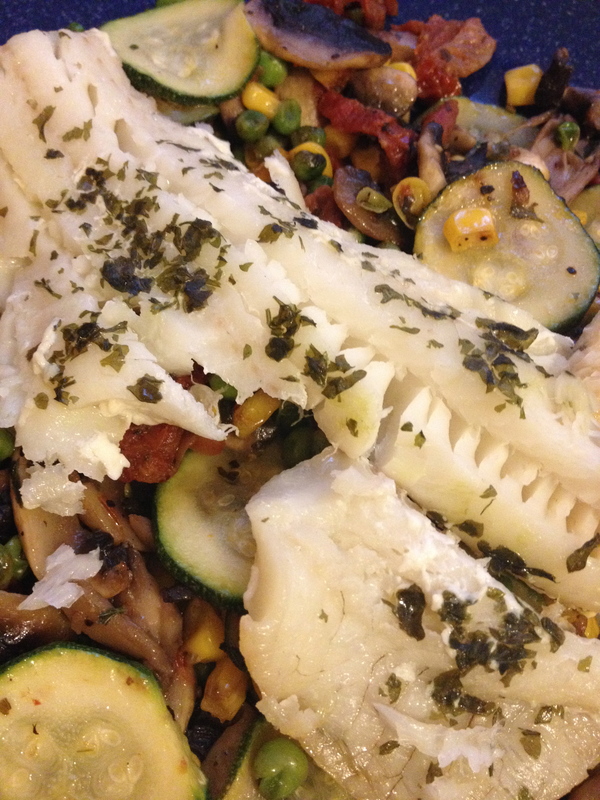 On warmed plates, place equal amounts of the vegetables on each and top each off with a piece of the pollock fish. Season and serve. Dawn: An inexpensive supper using a bag of pollock fish and found ingredients in the fridge with a total cost of about £1 per person. Excellent value and a nutritional, low fat supper that’s extremely easy to make. Pollock has been perceived as a somehow ‘inferior’ fish to its contemporaries such as cod or plaice and yet it has a lovely, delicate taste that seems to absorb fellow cooking ingredients to create quite superb meals and in terms of cost, is often far more accessible for peoples’ purses so please do try this fish if you haven’t yet. For more economical, tasty and easy to make food recipes, follow this blog – www.forfoodlovers.wordpress.com and click “Follow” over on Twitter @Love_Food_UK for regular food chat as well as finding the cooking sensation over on Facebook (please pop across and ‘Like’ Love Food). Oh, not forgetting the fab MumsNet Bloggers Network and Foodies100, too! Love egg and chips as a quick, cheap and easy supper? Well, this is a variation on a great British staple dish that’s lower in calories and looks good enough to serve in a top notch restaurant. Dawn: Decorated with a few sprigs of seasonal herbs, this makes a truly lovely and super quick evening meal with the herbs adding a delicious infusion and aroma. Simply delicious a dish to both make and eat. Peel and leave whole the potatoes. Dawn: You can leave the skins on and scrub them clean as they provide a lot of nutrients just lying under their skins. The choice is yours. Place a large enough saucepan on a high heat and add water that is already boiling. Ensure the water is still boiling and add a pinch of salt. Add the potatoes to the saucepan and cook until partially soft for about 8-10 minutes. 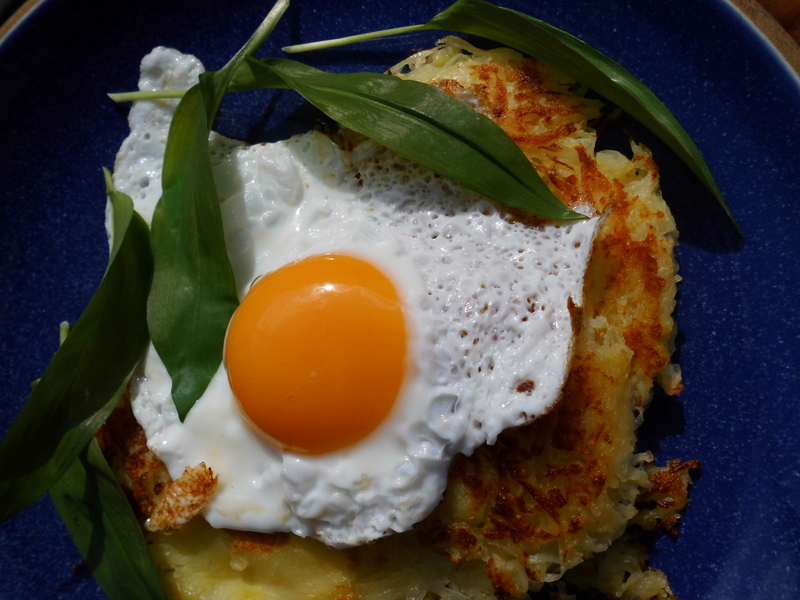 Dawn: To test to find out how soft the potatoes are, simply take a fork and poke it into the potatoes: if the fork is partly going into the potatoes, then they are ready for the next stage in the cooking process. Remove the partially cooked potatoes from the saucepan and set aside to slightly cool as you put half of the cooking oil into a frying pan. Heat the cooking oil on a medium heat. Heat the oven to gas mark 2, 130 °C electric. Now coarsely grate the potatoes and divide the mixture equally into four portions. Dawn: It’s worth pointing out that a portion size is roughly the palm of your hand in size. Put the four mounds of potatoes into the frying pan and shape them into flattened circles. Fry them slowly for about 5-10 minutes on a medium heat until, by lifting a ‘corner’ of each up with a fish slice, you can see that they are becoming golden brown in colour. Now, turn each over and cook the other side until golden brown, too. This takes another 5-10 minutes to do, too. When cooked to a satisfying golden brown colour, put the potato mounds on a baking tray and place in the oven while you cook the eggs. Add the remaining cooking oil to the frying pan and heat on a medium heat until the oil begins to bubble and a little haze comes off it. The oil is now ready to add the eggs to. Carefully break the eggs into the frying pan and fry for about 2-3 minutes until the whites have become opaque in look and the yolks are still soft. Remove the potatoes from the oven, plate up and add an egg to each. Season with salt and pepper, adding your preferred seasonal garnish. Dawn: I added wild garlic here as it grows freely close by. Washed and decorative, you can eat the flowers, too and it makes for a very attractive finish to the dish. This meal offers a lower fat version of deep frying traditional chips and helps with supplying much needed energy for our bodies in that potatoes supply vitamins C and B6 as well as providing carbohydrates to maintain a healthy diet. And shallow frying is a healthier alternative method of cooking as opposed to deep frying. For more economical, tasty and easy to make food recipes, follow this blog – www.forfoodlovers.wordpress.com and click “Follow” over on Twitter @Love_Food_UK for regular food chat as well as finding the cooking sensation over on Facebook (come ‘Like’, please). Oh, not forgetting the fab MumsNet Bloggers Network and Foodies100, too! Salad dressings are very easy to make and can be anything you choose: here’s a simple dressing to drizzle over a green salad or a simply cooked steak, chicken or oven baked fish. Dawn: I’ve used a 4:1 ratio of yoghurt to mustard in making this which is easy to apply to any quantity you require. Place the ingredients in a small, clean and sterilised glass jar with screw cap. Mix with a small teaspoon and shake to blend the ingredients together, adding salt and pepper if required. Dawn: And that, fellow foodies, is it! 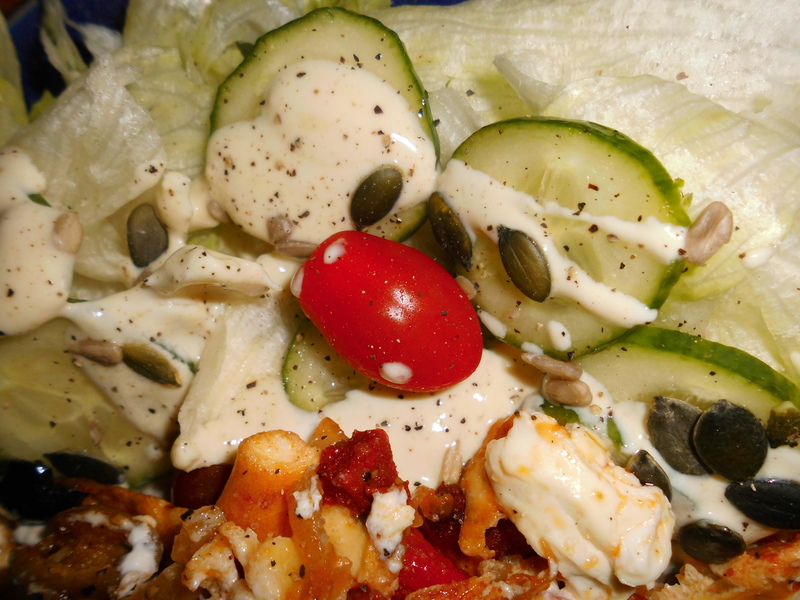 A low fat and tasty dressing for pence instead of pounds…both monetary and figure-wise!